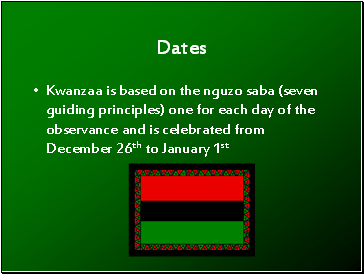 Kwanzaa is a unique African American celebration with focus on the traditional African values of family, community responsibility, commerce and self improvement. It is simply a time of reaffirming African- American people, their ancestors and culture. Which means first fruits of the harvest in the African language kiswahill. 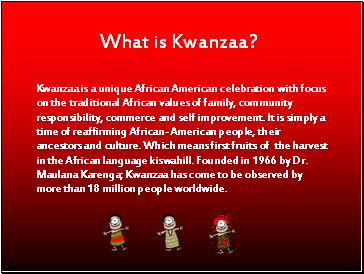 Founded in 1966 by Dr. Maulana Karenga; Kwanzaa has come to be observed by more than 18 million people worldwide. • Kuumba(creativity)is greatly encouraged. 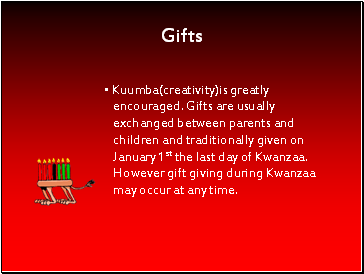 Gifts are usually exchanged between parents and children and traditionally given on January 1st the last day of Kwanzaa. However gift giving during Kwanzaa may occur at any time. 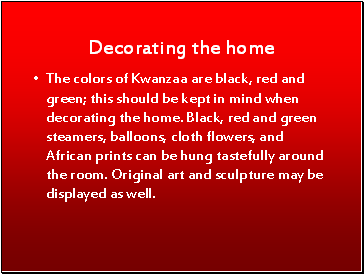 The colors of Kwanzaa are black, red and green; this should be kept in mind when decorating the home. Black, red and green steamers, balloons, cloth flowers, and African prints can be hung tastefully around the room. Original art and sculpture may be displayed as well. 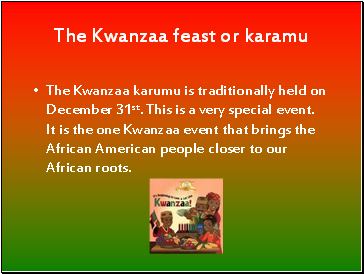 The Kwanzaa karumu is traditionally held on December 31st. This is a very special event. 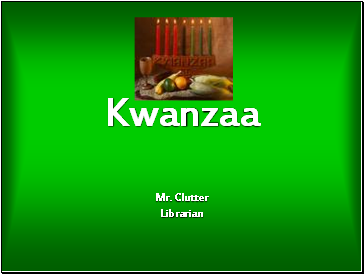 It is the one Kwanzaa event that brings the African American people closer to our African roots. Umoja (oo-MOH-jah): Unity – Success starts with Unity. Unity of family, community, nation and race. Kujichagulia (koo-jee-chah-goo-LEE-ah): Self-determination – To be responsible for ourselves. To create your own destiny. 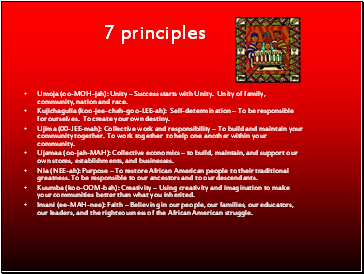 Ujima (00-JEE-mah): Collective work and responsibility – To build and maintain your community together. To work together to help one another within your community. Ujamaa (oo-jah-MAH): Collective economics – to build, maintain, and support our own stores, establishments, and businesses. Nia (NEE-ah): Purpose – To restore African American people to their traditional greatness. To be responsible to our ancestors and to our descendants. Kuumba (koo-OOM-bah): Creativity – Using creativity and imagination to make your communities better than what you inherited. Imani (ee-MAH-nee): Faith – Believing in our people, our families, our educators, our leaders, and the righteousness of the African American struggle.